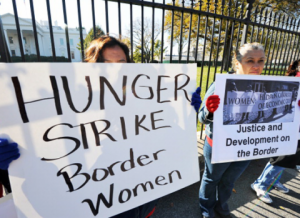 Eleven women from El Paso and Ciudad Juarez are holding a hunger strike in front of the White House to raise awareness of the US-Mexico border issues. The November 8th to 17th hunger strike aims to develop public awareness about the lives of women and families affected by the violence, poverty and unemployment in Juarez and El Paso. The women are calling on federal decision-makers to look beyond short-sighted border security initiatives and instead, establish long-term strategies to support community-led development of the nation’s poorest region. The women are part of the community organization, La Mujer Obrera and have family members on both sides of the US/Mexico border. The hunger strike is meant to pressure the White House and Congressional leaders to take action to end negligence and abandonment of border families and communities. The women are saying that the North American Free Trade Agreement (NAFTA) and the current US border security initiative have not helped border women, despite their own personal tragedies with border violence. The border women are leading by example in pursuing smart security and empowering local communities on both sides of the border. The La Mujer Obrera’s social enterprise daycare, restaurant, festival marketplace in El Paso and network of artisans in Mexico demonstrate the strength of border women in creating jobs and wanting to break the cycles of poverty and violence. Several religious advocacy offices and human rights organizations based in Washington D.C are expressing solidarity with the women by visiting them during their hunger strike at the White House. These women are being interviewed by the news media of Washington D.C. and Mexico City. Get involved by supporting the call addressed to Members of Congress to invest in development with border women workers.